(1953) Larry’s Chili Dog, Burbank | Remains of L.A.
-Six square green tables with tan folding chairs, a large awning and umbrellas over the tables that don’t fit under the awning, tall bushes surrounding the eating area and making it feel closed off from the world, a bright yellow stucco wall covered in signs, with windows through which one can see the kitchen. -I got a chili dog, because if a food is mentioned in the name of a place I like to get that food. 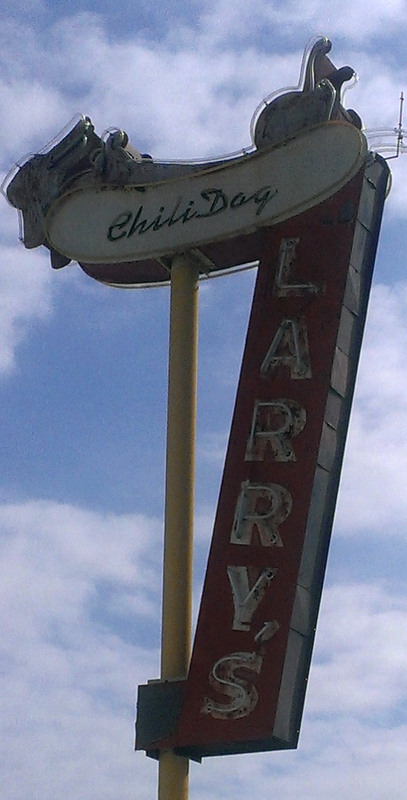 I’m not sure I’ve ever had a chili dog before, so I don’t know if it was typical; I enjoyed it a great deal. The chili did make the bread so soggy that at one point the hot dog fell right out of the bottom of the bun, but honestly that could have been my fault. It fell onto the plate so it wasn’t a problem. I also got fries, which were just right. -Through the window, on a wall in the kitchen, were a number of signed pictures of celebrities. The only one I recognized was Steve Carrell, but that doesn’t mean the others weren’t famous; some of them were sports figures and most were a little too far away to see clearly. There were a couple kids, one of whom was dressed like a mini-greaser and I thought he was named “Rockin’ Rollin’ Arto,” which is the best name possible, but I couldn’t quite read it so I asked and it turned out his name was just “Rockin’ Raffi Arto” which we can all agree isn’t as good. The counter guy assured me he was the next Elvis, though. -We sat and I assumed they’d call us from the window when our food was ready, but they brought it to us on trays. I couldn’t figure out where the door was that they came out of; I guess it’s around the back and that seems like a long way to come to bring us our food. I would have been fine with them calling. -On each table was a miniature picnic table that held salt and pepper and ketchup and mustard. I loved those miniature picnic tables. -A little girl, maybe six or seven, was having a conversation with her mom when I sat down. Mom: “Why do you put them on his toys? Why not put them in a tissue?” Little girl [almost shouting, exasperated]: “Because sometimes there are no tissues! !” Mom: “But you never put them on your own toys! Only his!” If you ask me, mom was being a little too obvious about how amused she was by her daughter’s behavior. -There are a bunch of unusual sodas on display in one of the windows. My favorite is “Mr Q Cucumber, the original cucumber soda.” I like the idea that they were worried so many people were going to try to steal their cucumber soda idea, they’d better make it clear they were the first. -Taped to the windows are a bunch of signs–just writing, Helvetica I think on regular printer paper–describing different ways they do hot dogs. One says, “Hawaiian Dog– Grilled Pineapples with onions. Topped with tangy BBQ sauce. Sweet Pacific Island goodness! !” Another says, “Phili-Cheesesteak Dog– Cheese, Mushrooms, Peppers & Onions melted together **Holy crap** ” There was also one called the “Crouching Tiger Hidden Dragon,” and a disclaimer under several warned that they were not for people with high cholesterol or heart conditions. -More than a lot of restaurants I’ve been to for this blog, this place really feels like it has been around, unchanged, for generations. Hidden away by the shrubs, it feels like a permanent secret. Sitting there made me feel unstuck from time. What Sort of Ghost I’d Expect to Find if I Believed in Ghosts Which I do Not: A group of high school friends, all of whom grease their hair back and wear leather jackets with matching emblems on the backs, and keep cigarettes behind their ears. I used to eat there often when I worked in Burbank. That and the chili and spaghetti place.